The Ice House :: Sirius XM Presents: ALL STAR COMEDY NIGHT- LIVE TAPING! 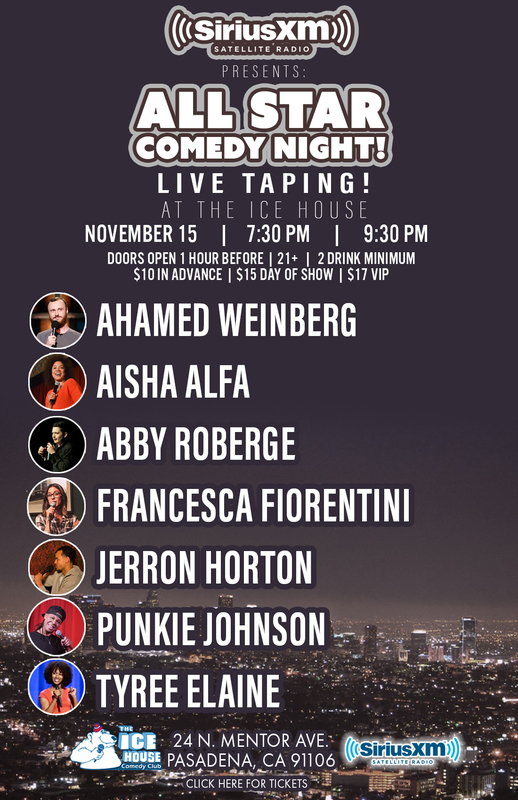 Sirius XM Presents: ALL STAR COMEDY NIGHT- LIVE TAPING! Tickets $10 in advance - $15 day of show. Get your tickets now! Aisha Alfa: Born in Nigeria, raised in Canada and now making her home in Los Angeles, Aisha Alfa has come a long way. A former pro soccer player, she broke into the entertainment scene and hasn’t looked back. Her film/TV career has seen her in many successful Canadian TV shows including Degrassi (no she didn’t work with Drake), Odd Squad, The Second City Project, Video On Trial, Too Much Information and the annual Air Farce New Year’s Eve Special. Aisha’s comedy side has grown and led her to be a finalist for NBC’s Stand Up Diversity showcase, a performer at the Just For Laughs Comedy Festival in Montreal and in Toronto, the all female SheDot Festival, the Winnipeg Comedy Festival, the Halifax Comedy Festival, Cape Town Comedy Club in South Africa and various clubs around North America. Aisha recently did her first Comedy Album, which is set to release this March called “You See Me Now”. Her webseries Open Engagement won the Just For Laughs web series pitch competition and the trailer can be seen on her website. Jerron Horton: Jerron Horton is a stand up comedian from Atlanta, GA whom currently resides in Hollywood. He is a funny guy that made the right career choice.